It is with regret and deep sadness that we report the passing of Frostburg Fire Department Brother Edward W. (Ed) George. Ed joined the FFD on November 26, 1974 serving with pride for 44+ years. 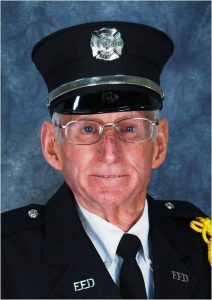 He served as the department’s Treasurer for many years and was bestowed the Firefighter of the Year award in 1989. Our thoughts and prayers are with his wife Jean, son Taylor, daughter Kathryn and their entire family. Family and friends will be received at Durst Funeral Home, 57 Frost Avenue, Frostburg on Saturday, April 13 from 4 to 7 pm. The Frostburg Fire Department will hold a Memorial Service at 6:30pm. A funeral service will be conducted at the funeral home on Sunday, April 14, 2019 at 2:00 pm with Minister Steven Hershberger officiating. Interment will be in Frostburg Memorial Park.